The downbeat, but moving The Wrong Man was Alfred Hitchcock's only film to be based on a true story. It is also perhaps one of his most personal films, focusing more intensely on the director's mistrust of police and authority which figures often in his other work. Henry Fonda and Vera Miles star in what would be among the strongest roles for both actors in this tense drama that is now available on Blu-ray from Warner Archive. Fonda stars as Christopher Emmanuel "Manny" Balestro, a musician who really was the string bassist in a jazz combo at the Stork Club. In 1951, only five years before the release of The Wrong Man, he was accused of a series of hold-ups because he so closely resembled the real thief. As he struggled to clear his name, the musician's wife Rose (played by Vera Miles in the movie) began to lose her sanity, leaving him with another, more complicated problem to face. Balestro's story first became public in the 1953 LIFE Magazine article A Case of Identity, written by journalist Herbert Brean. Brean wrote a film treatment for the story, which he then sold to Warner Bros. Hitchcock then hired playwright and screenwriter Maxwell Anderson to write the screenplay, which would stay very close to Manny's true story. This fidelity to reality can also be seen in the way Hitchcock films The Wrong Man. While he made liberal use of sets, there are many fascinating location shots of mid-century New York, including a few noir-worthy nighttime shots of the city and a couple of scenes filmed in the actual Stork Club. This is one of Hitchcock's most subtle works. He seems more in tune with the emotions of his characters and less preoccupied with games and plot twists. It is as if he feels deeply for his subject, and in a way identifies with him. In fact, Hitchcock had faced what he viewed as wrongful imprisonment as a five-year-old. Having misbehaved, the young Hitch's father sent to the local police station with a note that instructed that he be locked up so that he may be taught a lesson. Though the boy was only behind bars for a few minutes, that experience haunted him throughout his life, and it is assumed is at least part of the reason his films so often featured people who were wrongly accused or targeted. You can see the director's empathy with his terror-stricken characters in the details he chooses to highlight. He notes the way the arresting detectives hook their hands onto Manny's arm, depriving him of his freedom, and the way he reacts in silent horror to the fingerprinting ink on his hands. As he is searched and methodically relieved of his personal belongings, the camera steadily observes his increasing humiliation and helplessness. Hitchcock is equally attentive to Miles, as she silently and often in complete stillness communicates the deterioration of Rose's mental health. The director was remarkably in simpatico with the actress, always knowing how to frame her for maximum emotional impact. She in return accomplishes one of her best performances. I still wish I could have seen what this remarkably sensitive performer could have done with the lead role in Vertigo (1958), but she became pregnant and could not accept the role. Fonda is also at his best here in an equally subtle performance that I feel has been underrated because he is so understated. He plays a man who draws suspicion to himself not just because he resembles the real criminal, but also for his lack of outward charm. He is an introvert, sensitive, a bit tense and always with a serious expression on his face. Manny is the kind of man who gets lost in his own head and doesn't realize the fear he can cause when strangers wonder what he is thinking. Fonda communicates all those characteristics with delicacy, creating a character who is complex and intriguing not despite his remarkably clean-cut ways, but because of them. And Manny is thoroughly decent, surprisingly so for a musician who makes his living in nightclubs. He doesn't drink, he goes home right after work and he is an attentive father and husband, despite his unusual schedule. Hitchcock gives you plenty of time to like him before the trouble begins. For those reasons, the idea that he could be suspected of being wrong is utterly confusing to him. That hint of doubt in Rose, the thought that her seemingly gentle and religiously devout husband could be guilty seems to play as much of a role in her breakdown as the stress of the accusation. Hitchcock lavishes loathing on the system that fails these decent people. The detectives rush to blame Manny, never asking him for an alibi or even giving him the opportunity to call his wife so that she knows why he hasn't come home on time. They seem determined to find him guilty, so they can close their case and gloat over their investigative skills. His lawyer, while often helpful, can also be insensitive, laughing with a colleague as he endures the boredom of another trial while Manny looks at him in mute disbelief. Bernard Hermann matches the low key tone of the film with an unusually subdued and menacing, jazz-tinged score. He features the double-bass, Manny's instrument, as if to always make the musician's presence felt, even when he is not in a scene. It gives the music an interesting depth, as if it is also a character. The Wrong Man is a slow, excruciating and deeply compelling film, that ends up being more touching than you would expect because of the loving, if ultimately troubled family at its core. While the picture has a bit more grain and softness to it than in the typical Warner Archive Blu-ray release, the image quality is consistent and suits the gritty setting of the film. 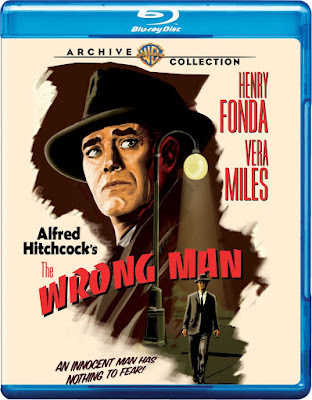 The disc includes a trailer for the film and the making-of documentary Guilt Trip: Hitchcock and The Wrong Man, which is an interesting exploration of the drama's themes and elements with particularly thoughtful insight from Peter Bogdanovich, Robert Osborne and film critic Richard Schickel. Check out the LIFE Magazine article that inspired the film here.